North Vancouver, B.C., October 16th, 2017. 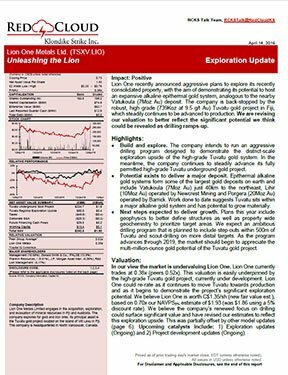 Lion One Metals Limited (TSX-V: LIO) (ASX: LLO) (OTCQX: LOMLF) (FSX: LY1) (the “Company”) is pleased to announce that its ongoing diamond drilling program has returned further high grade gold intersections at its 100% owned and fully permitted high grade underground Tuvatu Gold Project located near Nadi on the island of Viti Levu in the Republic of Fiji. Intersections rounded to nearest 0.1 meter and 0.1g/t. Refer to Table 1 for full details. 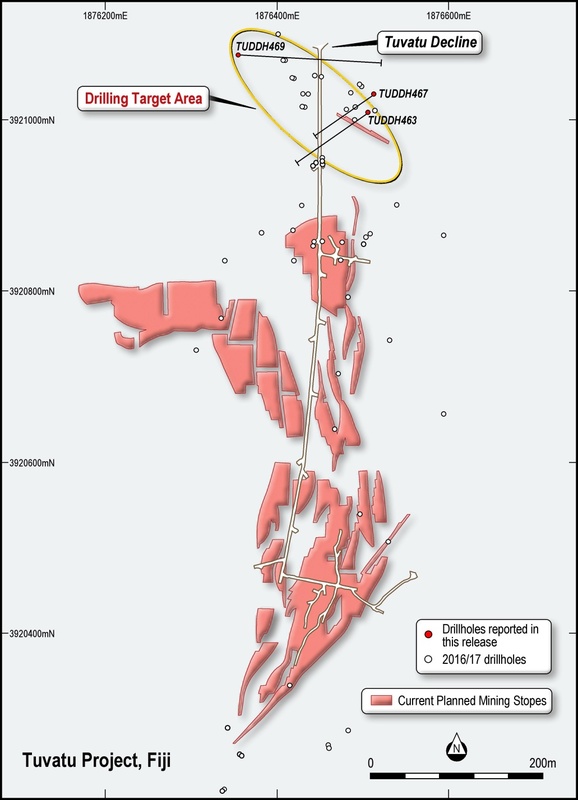 Drill results have been received from a further three diamond drill holes (TUDDH463, 467 and 469) completed on extensions to the Tuvatu Gold Project. These drill holes targeted the individual mineralised lodes within the recently recognised and potentially significant HT Corridor mineralisation. Please refer to Figures 1 and 2, and Tables 1, 2 and 3 for drill hole details. The previous resource estimate for Tuvatu included generally lower grade mineralisation in lodes named T1, T2, H1 and H2 and as announced in the NI43-101 resource estimate on 4 June 2014. Prompted by a reinterpretation and the recognition of high-grade mineralisation at surface, the Company returned to this area for further drilling in 2017. Other results from this current program have included 2.77 meters averaging 35.08g/t, 3.4 meters averaging 23.2g/t gold and refer to releases dated 22 August 2017 and 15 September 2017 for further details. The current mine plan derives most of its inventory from the UR lodes which are narrow high-grade structures oriented north-south and form along cracks in the host monzonite rock. The zone hosting the T and H lodes has been named the HT Corridor. The HT Corridor mineralization is of a different nature to the UR lodes and includes highly fractured, brecciated and wider zones of mineralisation striking northwest-southeast and dipping steeply to the northeast. The HT Corridor is characterised by a distinct biotite and potassium feldspar alteration which has enabled mapping of the corridor for over a kilometers to the northwest and 2 kilometers to the southeast of the existing drilling. The mineralisation identified in the 2017 drilling to date remains open in both directions along strike and also down dip. The contribution of the T and H lodes to the current mine-plan is minimal due to the 2014 modelled grades in this area, However, with the new higher-grade and wider mineralisation intersections, the Company expects that the overall grade and tonnage of the mineralisation in this area will increase. Furthermore, these mineralized zones extend from surface and crosscut the existing decline and hence have the potential to be exploited early in the mine-plan. The Company looks forward to announcing further drill results as and when they are received and compiled from the current drill program and, in time, a revised mine plan and mining inventory that includes this new discovery. Notes: Intersections reported here are often composite samples. Results reported here only include those which returned single intervals or composited intervals of > 2 gram.meters. TUDDH prefix denotes diamond drill holes drilled from the surface. Notes: For surface diamond drill holes, up to 26 meters of the poorly consolidated surface material was drilled using PQ3 (83.0mm core diameter) diamond core with remainder of the hole drilled with HQ3 (61.1mm core diameter) diamond core. Downhole surveys are carried out using a Ranger Explorer Mark 2 electronic multi-shot camera. Downhole surveys are taken at least once every 30 m.
Notes: This Table includes results from diamond drill holes reported on in previous Lion One news releases from the same mineralized zone. For these diamond drill holes, up to 26 meters of the poorly consolidated surface material was drilled using PQ3 (83.0mm core diameter) diamond core with remainder of the hole drilled with HQ3 (61.1mm core diameter) diamond core. Downhole surveys are carried out using a Ranger Explorer Mark 2 electronic multi-shot camera. 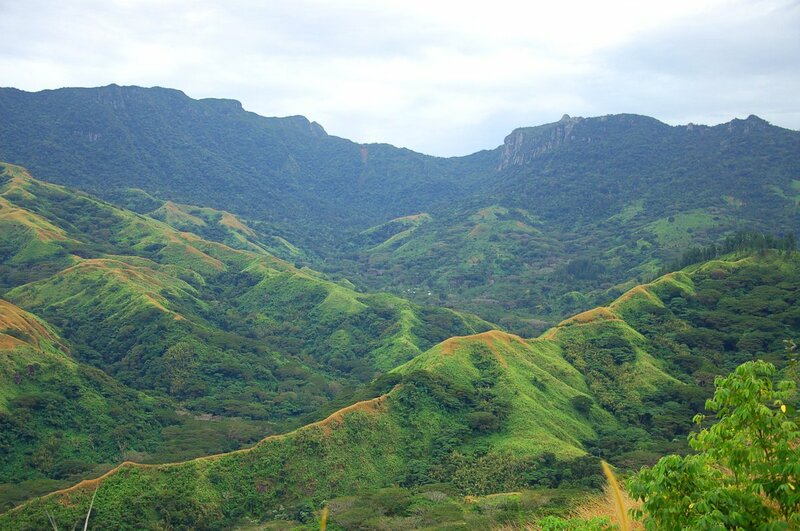 Downhole surveys are taken at least once every 30 m.
Lion One is advancing its 100% owned Tuvatu Gold Project as a near-term production opportunity in Fiji. Tuvatu is a low-sulphidation epithermal gold system and has a comparable footprint and geological analogies to other high grade epithermal gold deposits in the Pacific Ring of Fire such as Porgera and Lihir in PNG, and Vatukoula in Fiji. Tuvatu has been fully permitted by the Government of Fiji for operations start-up and has a dual-track strategy of production development and resource expansion inside its 385 hectare mining lease and on its wider extensive land-holdings in the area. Tuvatu is located 17 km from the international airport in Nadi, on the west coast of Viti Levu in the Republic of Fiji. Lion One’s CEO Walter Berukoff is leading an experienced team of mine builders, and has owned or operated over 20 mines in 7 countries. As the founder and former CEO of Miramar Mines, Northern Orion, and La Mancha Resources, Mr Berukoff is credited with building over $3 billion of value for shareholders. Tuvatu was advanced by previous owners through underground exploration and development from 1997 through to the completion of a feasibility study in 2000. Acquired by Lion One in 2011, the project has over 110,000 meters of drilling completed to date in addition to 1,430 meters of underground development. In January 2016 the Hon. Prime Minister of Fiji, Mr. V. Bainimarama, formally presented the previously granted Tuvatu Mining Lease to Lion One. This concluded the permitting process for the development of an underground gold mine and processing plant at Tuvatu, demonstrating strong government support for Fiji’s 85 year-old gold mining industry. 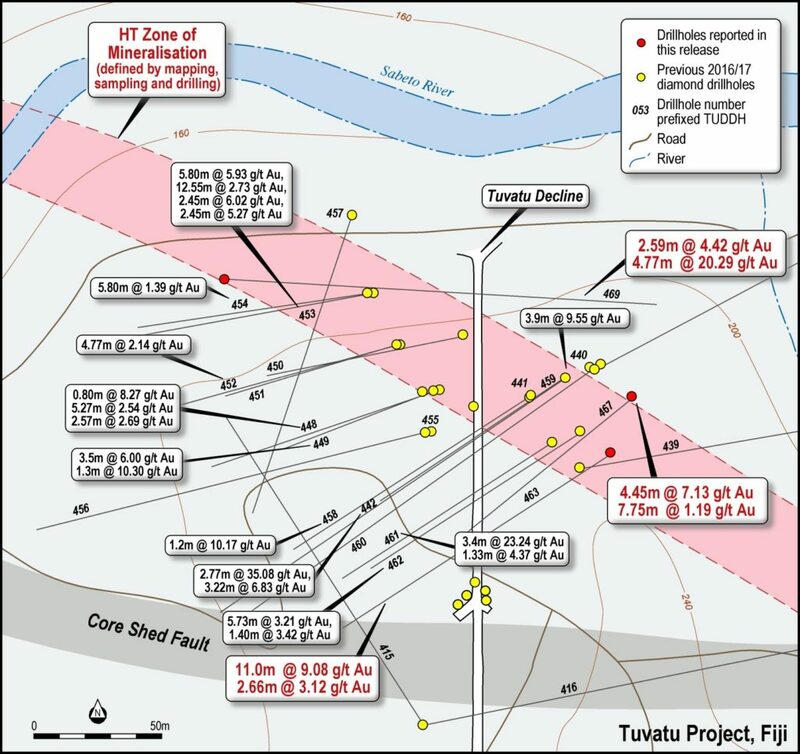 As per its independent June 1, 2015 NI 43-101 PEA Technical Report on the Tuvatu Gold Project, the Company envisages a low cost underground gold mining operation producing an initial estimate of ~353,000 ounces of gold at head grades of 11.3 g/t Au over an initial 7 year mine life. Estimated cash cost is US$567 per ounce with all-in sustaining cost of US$779 per ounce. Total capex of US$48.6 million includes a contingency of US$6.1 million with an 18 month preproduction schedule and 18 month payback on capital. At a US$1,200 gold price, the project generates net cash flow of US$112.6 million and an IRR of 52% (after tax). The Company is not basing its production decision on a feasibility study of mineral reserves demonstrating economic and technical viability; as a result there is increased uncertainty and economic and technical risks associated with its production decision. Mine engineering and underground development is progressing alongside final detailed engineering for the Tuvatu processing plant and site infrastructure. The Company has now dewatered the existing Tuvatu exploration decline to 560 meters from the portal down the decline. The decline was completed in the year 2000 by Emperor Gold Mines, comprising 1,430 meters of underground development including drives, cross cuts and raises. In conjunction with the dewatering, ventilation fans and lighting were installed early in 2017 and are running 24 hours per day. The rehabilitation of the decline is ongoing as dewatering progresses, but in general the stability and ground conditions have been shown to be very good. The areas of rehabilitation and regularly reviewed and approved by Mine Inspectors from Fiji’s Mineral Resource Department. Information in this announcement relating to exploration drilling at the Tuvatu project is based on data compiled by Lion One’s Managing Director, Mr Stephen Mann, who is a member of The Australasian Institute of Mining and Metallurgy. Mr. Mann is the Qualified Person (“QP”) responsible for the Tuvatu exploration program and has prepared and approved the technical information in this news release. Mr. Mann has sufficient experience which is relevant to the style of mineralization and type of deposit under consideration and to the activity which they are undertaking to qualify as Competent Persons under the 2012 Edition of the Australasian Code for reporting of Exploration Results, Mineral Resources and Ore Reserves. Mr Mann consents to the inclusion of the data in the form and context in which it appears. The Tuvatu Mineral Resources have been estimated by Mining Associates, an external consultancy, and are previously reported under the 2012 Edition of the Australasian Code for reporting of Exploration Results, Mineral Resources and Ore Reserves (see LOL -ASX announcement 4th June 2014 titled “Lion One Announces Revised NI 43-101 Resource Estimate: Increased Tonnage and Grade at the Tuvatu Gold Project, Fiji”). The Company confirms that it is not aware of any new information or data that materially affects the information included in the original market announcements and, in the case of estimates of Mineral Resources that all material assumptions and technical parameters underpinning the estimate in the relevant market announcement continue to apply and have not materially changed. The company confirms that the form and context in which the Competent Person’s findings are presented have not materially modified from the original market announcements. The Tuvatu historical exploration results have been sourced from data collected by previously listed companies which have undergone a number of peer reviews by qualified consultants, who conclude that the resources comply with the JORC code and are suitable for public reporting. This information was prepared and first disclosed under the JORC Code 2004. It has not been updated since to comply with the JORC Code 2012 on the basis that the information has not materially changed since it was last reported.